Secondary set for Fox 35 Orlando (WOFL) that debuted in 2017. 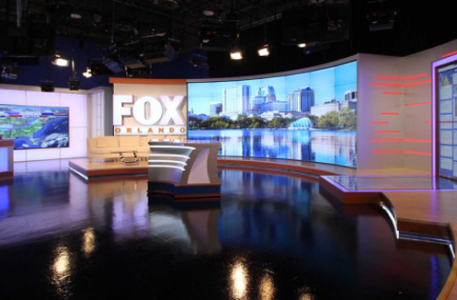 After the success of their main studio, WOFL approached FX Design Group to design a multipurpose set that would be predominantly used for their “Good Day Orlando” newscast. The set needed to be open and flexible enough to allow for easy transformation from a small interview layout to a large performance stage. To help tie the new set in with their main studio, we designed in similar shapes and lighting accents as well as implementing large video technology. Matching its big brother in Studio A, we also incorporated the same copper, aluminum and wood floor finishes. Designed into the set is a 3×3 46 inch array, three vertical 70 inch monitors and one 80 inch monitor. Framing in the technology are several RGBA LED ribbons of various sizes as well as large portions of LED backlit walls.